When trauma, oral disease or decay wreck a smile, patients may feel hopeless, even embarrased to seek dental care. Quality of life is very important and a new smile and comfortable teeth will help you feel better physically and emotionally. 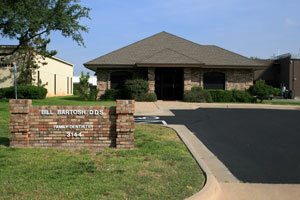 Dr. Bartosh and his staff have many years of experience and education to help even the most orally disabled patient. When you schedule a consultation appointment, Dr. Bartosh will take all the time necessary to discuss your concerns and goals in restoring your mouth. A detailed examination of the teeth, gums, bone structure and tempero-mandibular joints will be completed. X-rays and study models aid in preparing a treatment plan that is custom made to fit your needs. All treatment options will be presented to you along with the financial obligation involved. As complex treatment plans can take several months to complete, we make every effort to work with your schedule so that the work can be accomplished in the shortest time possible. With Dr. Bartosh's skill, compassion and pain free care, you too can have the comfort, health and beautiful smile you deserve. Call for your appointment today and Debbie or Breanna will be happy to assist you.